Real live agents on stand-by! 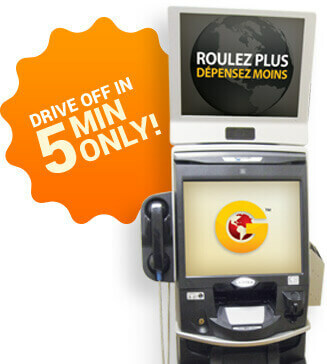 rental cars in just 5 Minutes! Are you tired of car sharing… Getting into a dirty car? A faster, easier way to rent a car! What do you do after 6:00 PM when you need help renting a car or have a question and everyone else is closed? Our car rental specialist are there during extended hours till 9:00 PM – 7 days a week! Our repeat clients are surprised to see how easy it is to pick up a car using our kiosk. Returns are even easier, just drop the key in the drop box and Go! Inspections are done by our agents and reported back to you within 24 hours – usually much less. Unlike car sharing: A new and clean auto rental is always waiting for you! Once you have used it once, you will love it every time you need to hire a car.